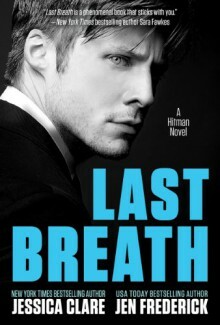 For the first month of release, Last Breath will be sale-priced at $3.99 to reward early purchasers. The price will revert back to its original retail listing of $4.99. ReganI never really knew what misery was until the day I was kidnapped and sold for being in the wrong place at the wrong time. Two months later, I'm at a brothel in Rio when I meet Daniel Hays. He says he's here to save me, but can I trust him? All I know of him are his sarcastic retorts and his tendency to solve every dispute with his gun. He's also the only safe thing in my world, and I know it's wrong to fall in love with him, but I can't seem to help myself. He says he'll protect me until his last breath but I don't know if I should believe him or even if I can.DanielFor the last eighteen months, I've had one goal that has dictated every action I've taken. I've left the Army, turned paid hit man, and have befriended criminals all across the globe to find my kidnapped sister. In every brothel I raid or every human trafficking truck I stop, I hope the next face I find is my sister's. In a hidden brothel in Rio, I find Regan Porter, bruised by not broken and still sane despite her weeks in captivity. I should leave her behind or send her home because the last thing either of us needs right now is to get involved. But with every passing minute, I find I can't let her go.Please note: this contains some scenes that sensitive readers may find upsetting or triggering.